JUDGE Ester Veloso of the Regional Trial Court Branch 6 yesterday ordered the “provisional” dismissal of the kidnapping charged against a former call center worker accused of taking an infant from the Vicente Sotto Memorial Medical Center (VSMMC) last Jan. 4. Veloso dismissed the case after the arresting officers and the baby’s parents failed to attend the hearings against Melissa Londres. The defense moved for the dismissal of the case and the public prosecutor did not oppose it. But Prosecutor Llena Ipong-Avila said the case may be filed again if the complainants show up and decide to pursue the case within two years. Veloso also ordered Londres’ release from the Cebu City Jail, unless she is detained for another offense. Assisted by her lawyer Christopher Ruiz, Londres had entered a not guilty plea during her arraignment last Feb. 1. Assistant Regional State Prosecutor Raul Cristoria found evidence to charge Londres with kidnapping for taking Prince Niño Celadenia from the hospital. Londres was indicted although the baby’s parents executed their affidavit of desistance. “There is nothing in the affidavit (of desistance) that says the fact from which the alleged crime occurred did not exist,” read Cristoria’s two-page resolution. The crime is a non-bailable offense. On the other hand, Cristoria dismissed for lack of evidence the criminal complaint against Londres’ boyfriend, Philip Winfred Almeria. The Criminal Investigation and Detection Group (CIDG) 7 charged Londres and Almeria with kidnapping and serious illegal detention before the prosecutor’s office. Celadenia’s parents, Jayvee and Jonathan, later backed out from pursuing the complaint after Londres’s mother visited Jayvee’s mother and pleaded with her to drop the case. Jayvee’s mother pitied the respondents and decided to forgive them. The couple was quoted as denying having received P100,000 as a case settlement. In her complaint-affidavit, Jayvee said she was nursing her newborn child inside the hospital’s Child Survival Center last Jan. 4, 2016. Londres, who posed as a nurse, approached Jayvee and told her that her baby needed anti-dengue vaccination. Jayvee tried to accompany Londres to the laboratory, but was told to just wait outside of the room because of hospital policy. A few minutes later, Jayvee said she was surprised when Londres hurriedly walked out of the laboratory room toward the exit door. Dr. Gerardo Aquino, the hospital chief, instructed the hospital’s CCTV operator to review the video footage of the infant’s kidnapping. The couple also reported the incident to the police. 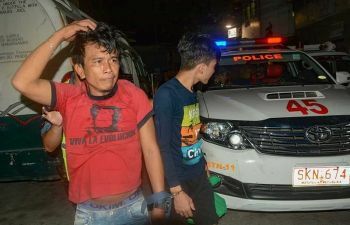 Last Jan. 5, Jayvee received a call from CIDG 7 informing her that they had recovered the infant and arrested the suspects. Jayvee also identified Londres as the one who kidnapped her baby from the hospital from the police’s rogue gallery. After she was arrested, Londres insisted Prince Niño was her son with her boyfriend Almeria. But Londres later admitted she kidnapped the baby from the hospital to prevent her boyfriend from leaving her. In his counter-affidavit, Almeria said he did not know that Londres stole the baby. The accused made him believe that infant was his son. He said his girlfriend told him that she gave birth inside the taxi, and she was later “cleaned” up in a clinic. Londres did not submit her counter-affidavit and just waited until the Celadenia couple executed their affidavit stating their “unconditional forgiveness” of her. In the resolution, Prosecutor Cristoria said that Londres failed to refute the charges. The affidavit the Celadenia couple executed is relevant only in the civil aspect of the case.